The first match was on Thursday 27 March 1958 at Witter Rugby Field against the University of California (also known as the Golden Bears). Their coach was the legendary Miles (Doc) Hudson who guided them from 1938-75. The Wallabies won 12-5 with Rod Phelps and David Emanuel scoring tries and Jim Lenehan and Ron Harvey kicking penalties. The Uni scored a try through wing Jim Duff which was converted by fullback Tom Trutner. The Uni team contained Pat Vincent from Christchurch, NZ and John Harrison from Sydney, Australia. The University’s tough Grid-Iron code forwards battled it out throughout the game against the Australian pack, and play appeared likely to get out of hand several times as fierce exchanges occurred. Referee J.M Mullin of Stamford University, twice had to break up rival forwards who were trading blows. The second match on Saturday 29 March was against an "All-Stars" team that had 7 players backing up from the Thursday match but also included Australian-born players John Dowse, who went on to represent the Wallabies in 1961 and Derry Hill who played for NSW 3 times from 1956-60. The Wallabies won the second match 35-3 (Graham Bailey 2, Eddie Purkiss, Kevin Ryan, Nick Shehadie, David Emanuel, Des Connor, Jim Lenehan, Ron Harvey tries; Harvey 3 goals, Jim Brown goal) to a penalty from Dowse. 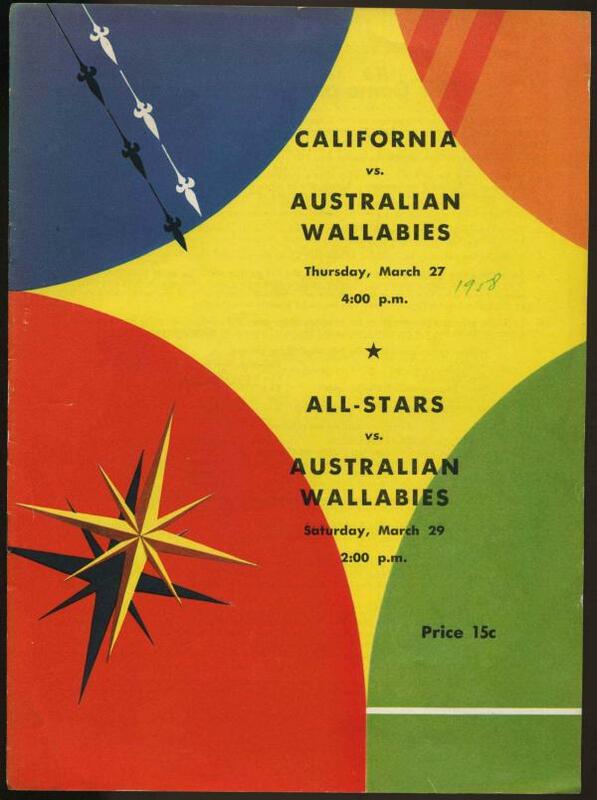 If you have any programmes or memorabilia relating to the 1957/58 Wallaby tour from matches in France or North America please get in touch (we have a few members require these extremely rare programmes).